The 2012 Nuits Saint Georges 1er Cru Clos des Forets Saint Georges comes from vertically planted vines that are perpendicular to the RN74. Different geological expressions up the slope are blended into three different cuvees, which are then assembled prior to bottling. It has an attractive nose of wild strawberry and mulberry fruit intermixed with forest floor scents: well-defined with subtle use of both oak and whole bunches. The palate is medium-bodied with a sorbet-like freshness on the entry. This is full of energy and vitality, the acidity well-judged with admirable weight and presence on the masculine finish that suggests this will age very well. Superb. 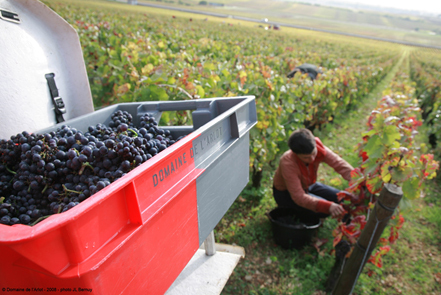 The 2012 Nuits-St-Georges Village comes from the younger vines in Clos de l’Arlot that are around 13-years old. It has a light raspberry and wild strawberry bouquet with damp undergrowth and wet moss notes emerging with time. The palate is nicely balanced with fine tannins. The acidity is well-judged, although the hail seems to have denuded this village cru of weight and presence on the finish. Still, it will make enjoyable early drinking.